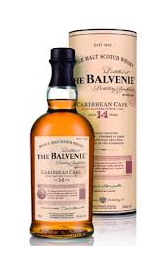 The Whisky Wire: Balvenie Caribbean Cask "Irresistibly Irie"
Balvenie Caribbean Cask "Irresistibly Irie"
In the year that marks David Stewart’s 50th Anniversary at Balvenie, it’s only fitting that this illustrious legend of a malt master is toasted with an appropriate duo of drams. Well as it happens and thanks to the honed half century crafting skills of David, Balvenie have released two bottling's for this very occasion. Now if you have a spare £20,000 in the bank or the same amount in change down the back of the sofa you could treat yourself to a bottle of Balvenie Fifty. A single cask offering that was distilled in 1962, the same year that David joined the company. I’d love to provide tasting notes for this bottling but because of its price and availability of just 88 bottles, the words ‘no chance’ have never been more appropriate with regards to being able to sample it, unless of course you’re fortunate enough to be one of the upper echelons in the whisky world. However there is that second offering that we can all enjoy and toast David’s milestone with, in the form of the new Balvenie Caribbean Cask. I say new as it’s exactly that to the UK market but it has infact been doing the rounds in the US and travel retail over the last year, and to much great acclaim. As a passionate pioneer and forefather of the finish, it has to be said that the 14 Year Old Caribbean cask, which is finished in Caribbean rum casks, is the perfect testament to a great man’s work. The nose kicks off with an alluring and eclectic array of delights. Glugs of wood spice, black pepper infused honey, lime zest and slightly over toasted malted loaf lead the charge, but it’s not long before notes of freshly cut grass, pineapple, ortanique, pear and even a hint of camomile join the proceedings. Rum soaked sultanas make for the next set of nasal niceties, subtly exuding all the rich decadent demerara deliciousness of a good quality pre-teen aged golden rum. But it’s not long before something more fragrant fresh and white rum-esque comes through. Those rum notes don’t hang around for ever, infact if left unleashed in a glass for more than five minutes they begin to evolve into something more reminiscent of freshly varnished oak. Which I can assure you in this instance is a good thing. Sweet wondrous whiffs of warm toffee tablet and freshly made vanilla fudge then provide a fabulous and flouncing air of balance and depth, as does the emergence of puffed infusions of sweet damp musk, ground almonds, buttered asparagus and a frond of caramelised fennel. The palate kicks off with a harmoniously hugging slice of toasted malt loaf that’s been smeared with lime infused honey, followed by waves of garish but glorious wood and winter spice. Warm runny butterscotch sauce and a few generous grounds of black pepper make for the next set of delights, along with a big wedge of a tropical fruit custard tart and some smoked pears drizzled in corn syrup. Bountiful and competing bouts of oak and vanilla then provide some fabulous interplay, and it's not long before they drag more of those sultanas and a pan of semi dissolved demerara sugar into the equation. All in all this is one charismatically complex, beautifully balanced and fabulously finished drop of drammage. Its finish if anything is even more complex and concentrated, delivering something that is lush, lingering, spiced, dry and deeply delicious.